Make nature magical for your little ones at this whimsical workshop with Fiona Danks and Jo Schofield as they launch their fantastical outdoor guidebook Wild Things. Meet Fiona and Jo and help your little explorer craft magical creatures out of clay and natural materials and create their own wand—perhaps even learning how to spot fairies and track dragons along the way. All materials will be provided, but aspiring spell casters should remember to bring a special token to make their wand magic—it can be anything natural that catches their eye, such as a beautiful leaf, a bright feather, or a tiny shell. Parental supervision is required. 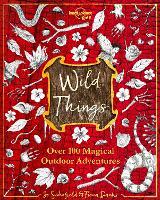 Both authors will be signing copies of Wild Things after the event. Tickets: Free reservation—simply reserve a place for each person attending below!